Findings from scientists at the Research Institute of Internal Medicine published in the prestigious "Journal of the American College of Cardiology" (journal impact factor 19.9) has received attention. 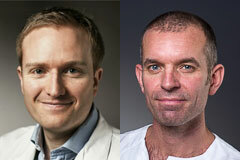 Martin Kummen and Marius Trøseid are first and last authors on the publication, entitled "Gut Microbiota Signature in Heart Failure Defined From Profiling of 2 Independent Cohorts". The Norwegian popular science web site "forskning.no" has recently written about the results, and interviewed senior author Marius Trøseid about the linking of gut bacteria flora to chronic heart failure. Kummen M, Mayerhofer CCK, Vestad B, Broch K, Awoyemi A, Storm-Larsen C, Ueland T, Yndestad A, Hov JR, Trøseid M.
J Am Coll Cardiol. 2018 Mar 13;71(10):1184-1186. doi: 10.1016/j.jacc.2017.12.057. No abstract available.